Lewis Hamilton says he is not frightened of anything - except spiders! "When I was young I was shy to a certain extent," he says, "but I have never been scared of doing anything exciting. I haven't jumped out of aeroplanes and stuff like that but I will do that at some point. I am really at liberty to say some of the things I have done but I am pretty relaxed by nature but I hate spiders. A lot of people have that sort of phobia." As a child he was not overawed by much. In 1991 - at the age of six - Lewis appeared on the celebrated BBC children's television show Blue Peter to talk about his racing. At 10 he won his first British karting championship and, famously, walked up to McLaren boss Ron Dennis and introduced himself and told Dennis that one day he would be a McLaren driver. "I don't remember saying it," Hamilton says. "I remember going up to him. He was very laid back and I was surprised that he had time for me because some people at that level don't have any time for anyone. He gave me a good 10 or 15 minutes so that was quite special. I was there because I had won the British championship and I went around the dinner with an autograph book. I got of people: Damon Hill, Colin McRae, Richard Burns, John Surtees. A lot of great names. I was a year too late for Ayrton Senna. He had been there the year before." Hamilton admits that he is not one to get star-struck about motor racing people - even at that age. "I don't know why it is," he says. "If I met Eddie Murphy or a movie star it would be like 'Wow!' but when it comes to motor racing I don't think like that." Perhaps it was his early start. "I started watching Formula 1 when I was about six," he remembers. "My parents were divorced and I spent weekends with my Dad and that was when the Grands Prix were on the TV. My Dad had just got into watching it and so I started to understand what it was. I enjoyed watching Senna drive and the battle between Senna and Alain Prost. I don't really recollect many of the races with Nigel Mansell. I did not really take to him. Gradually I started watching more and more but I was not a huge fan until I was about 13." 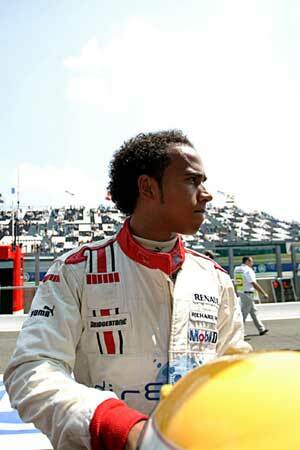 After a stellar karting career, Hamilton moved into cars in 2002 in Formula Renault. He finished third in the British Championship at his first attempt and won the title in 2003. In 2004 he moved to the Formula 3 Euroseries and finished fifth at his first attempt. The following season he won the title. He moved this year into GP2, joining the ART team alongside the experienced Alexandre Premat, who had won races in 2005. It was expected that he would have a learning year but right from the start he was impressive and by the end of the year had not only outshone Premat but also won the title. "I've done pretty well," he says. "I am happy with it, You know when you go into a season you don't expect to do so well. I think we had the right approach. Fortunately I was in one of the top teams and ART did a great job. I had confidence in the team and for me it was just about learning as much as I could from my team mate. When I got there I was immediately ahead of him. Step by step we improved and I happy with the way it went. It was hard, by no means an easy thing." "Absolutely not. It was a fantastic season, I learned a lot in such a short space of time - and there were a lot of good guys out there. It was intense because you had about 10 laps to learn a new track. It was a bit more demanding than before in F3." And what about the speculation about F1? "I think I managed it quite well. I tried not to read too much into the reports. If you get too into it, you can lose your motivation. I needed to win. And it got harder as the other teams were getting better." And so Lewis is ready for F1? "Every driver is going to be baised and say I am ready but I think I am, in terms of confidence and experience. I have three times as much experience as Kimi Raikkonen had when he went into F1 and more than Jenson Button as well. I have enough and in GP2 I have proved that I can go into a quick car and be right on it." The fact that his friend Nico Rosberg made the same leap last year must given Lewis confidence. "I don't think it gives me extra confidence but it proves it is possible. Nico and I were team mates in karting and he was always one of my main competitors. He has done a fantastic job in F1. It is strange to see him and Robert Kubica doing so well. Five years ago we were all in karting and we were all struggling to some extent. Nico and I were struggling with our equipment, Kubica was struggling for money. I never thought that five years down the line we'd all be in F1." "I am not the sort of driver to answer that question," he says wisely. Perhaps it is better to ask which of the drivers he has raced against Lewis respects the most. "Nico and I were team mates for two years," he says. "We have a fantastic relationship. At the time we went everywhere together. We were like brothers and you have respect when you are like that. I also have a good respect for Robert (Kubica). I did not have too many wheel-to-wheel races with Nico but I have had some extremely exciting races with Kubica. He is one of the best drivers and I think one day he will be a World Champion. We all had our different techniques but Kubica seemed to be able to pull out extremely quick laps. But then he used to blow his engines all the time! Nico and I would be up the front and consistent. I think we all have the potential to race in F1 and to be World Champions." And some of the other young guns in F1? "Heikki Kovalainen was a couple of years ahead of us, like Tonio Liuzzi so I didn't really race them." Looking back what is Lewis's proudest moment? "That is a good question," he says. "I would have to think about it. Each year something new happens. It is not necessarily better. Winning is good. Winning is what matters. Some wins are better than others. To win my first race at Monaco in Formula 3 was quite special for me. This year coming from eighth and winning at Silverstone was special too. When you go into a race you have a certain amount of confidence because you know what you can do from where you are starting. But you don't go into a race in GP2 thinking of winning when you start eighth on the grid. Each time I overtook someone I thought: 'I'm sure I can get a couple more places'." And the spectacular move on Nelson Piquet Jr.? "Yeah, that was a nice move," Hamilton says with a smile. "It was exciting now that I look back on it. I did not appreciate it much at the time and as soon as I was round the corner I had forgotten about it. I was focussed on catching the leader." Talking to Hamilton, one is impressed that he is so grounded and down-to-earth. He seems very mature for his age. "I think the reason for that is that since I was 10 I was at the race track every weekend. I wasn't hanging out and doing stuff with my friends. I was with Dad and I had to be best friends with my Dad. You want to fit it and mix with the grown-ups and so you have to learn at a faster pace than other kids. It is tough growing up and missing your childhood, because you never get it back, but if I make it I can have all the toys that I want!" Lewis may have to wait for sky-diving and such things but there should be plenty of thrills ahead for a 21-year-old McLaren driver. He just needs to watch out for spiders.